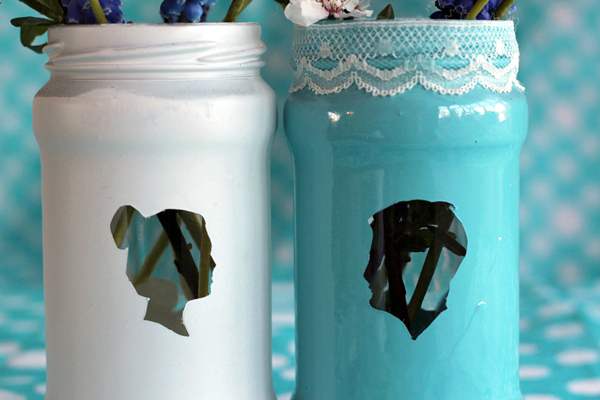 In this tutorial, you'll learn how to create you own profile outline and use it as a stencil to transform old jam jars into stunning silhouette vases. You could also make gorgeous personalised wedding decorations or tealight holders by using the silhouettes of the bride and groom. Read on for the full step-by-step tutorial. Two or more old jam jars. Two cans of 100ml color spray (we used fast dry enamel in sky blue and white). Craft knife (X-acto or Stanley knife). 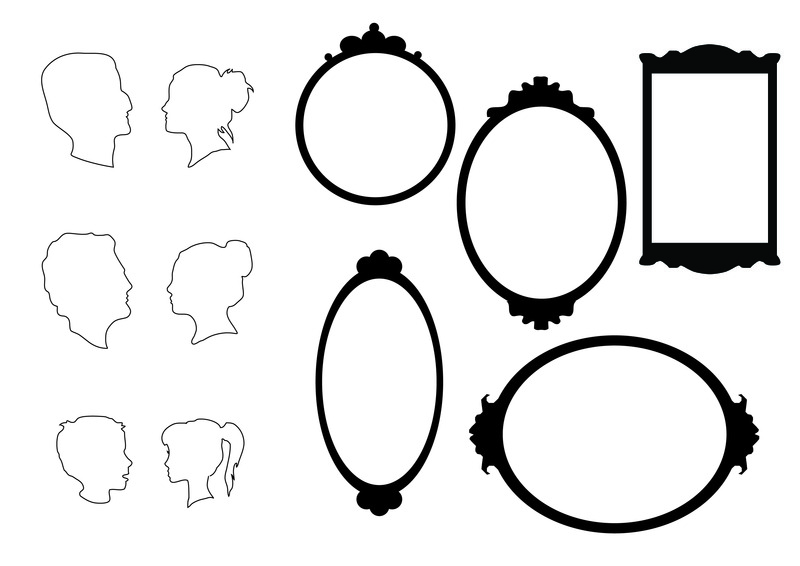 If you don't want to create your own silhouettes and designs, choose from the variety of classic silhouette profiles and decorative borders we've created for you to download. Print them out on a sheet of A4 paper and each design should fit an average jam jar. Otherwise, follow the instructions to create your own silhouette in Step 3. First, clean your jam jars and remove all labels. Sink them in a cooking pot of boiling water for a couple of minutes. Take them out carefully, and when they start to cool slightly, peel off the sticky labels. The heat makes the labels soft and easier to remove. Rub them to remove any sticky residue (you could also use methylated spirits). Rinse and dry carefully. Ask your subject to turn sideways to the camera and make sure their face is in complete profile. It is important that the subject is not turned three-quarters to the camera. Your camera should be positioned directly opposite your subject and at eye level. A solid background of a contrasting color works better. I used a dark blue background to define the outline, however this made things slightly tricky around the hair. For a more realistic profile, the subject should have a relaxed facial expression. Once you have your photo, print it on a sheet of A4 paper several times. You will need to shrink the portrait to around 3cm x 3cm. Trace around the outline of your subject on your printed photo using a fine tip pen. You will have lost a lot of detail when you shrunk the photo to a small size, so keep your outline minimal. If you're not happy with your outline, try again on another printed photo. Now, place the contact paper over your photo with the paper side facing upwards. Using the fine tip pen, trace over the outline on to the contact paper. Use your craft knife to carefully cut out around the outline of the silhouette. Be careful when cutting and mind your fingers! If you wish to make a couple, you need to make another silhouette. Create the other outline using the same method as described above. Just make sure the person is facing the other side, so that the two portraits face each other in the end result. Now, it's time to make a frame for the two figures. Select the border that best suits your jam jar. Make sure the silhouette fits neatly inside. Fold a piece of contact paper in half and place it over the selected frame with the paper side facing outwards. Trace the frame's outline using the fine tip pen. Cut around the frame using your craft knife. You should now have two identical frames for your silhouettes. Place the cut-out contact frames and portraits on your jam jars and position them carefully. Once you're happy with the position, remove the backing paper from the frame and stick it carefully on to the jar. Make sure the decorative details are oriented straight up and down on your jar. For a sharp outline, rub the edges of the stickers using your fingers. Make sure there are no little air bubbles or spaces for the color to penetrate your silhouette. When the frame is in place, attach the portrait sticker to the glass in the center of the frame. Now, take the jam jars outside and place them upside down on a sheet of paper. Make sure the lids are off the jars. Mask the surrounding area with newspaper or dust sheets. Before you begin spray-painting, wear a face mask for safety purposes. Shake the can of spray paint well and follow the instructions on the can. While spraying, hold the can parallel to the jam jar and at a distance of 20cm. Keep in mind that several thin coats are always better that one heavy coat, and try not to spray too much in one place, as paint may start running. Once all areas of the jar are equally covered with color, leave to dry. Once the jars are dry, carefully remove the contact stickers from the glass. 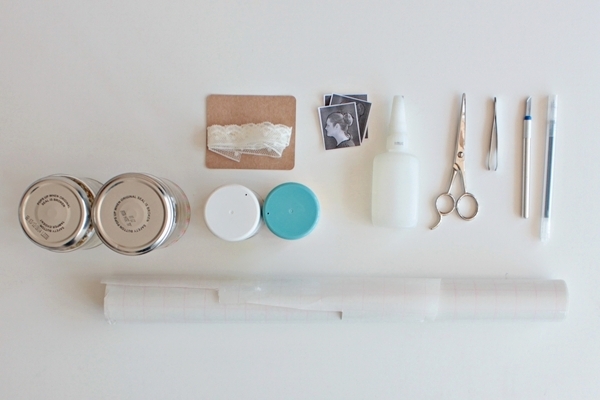 Use your craft knife to carefully lift an edge of the contact paper and peel back the sticker using tweezers. Be very careful that you don't peel off the paint inside the border sticker. If there is any extra unwanted paint inside your silhouette, use your craft knife to carefully clean it up for a sharp and precise outline. As a finishing touch, you could add some lace decoration on top of the blue vase. White lace contrasts beautifully with the blue and enhances the vintage look of your 'vases'. Calculate the length of lace needed to wrap around the top of the jar. Then just cut the lace and glue it carefully in place. Well done. 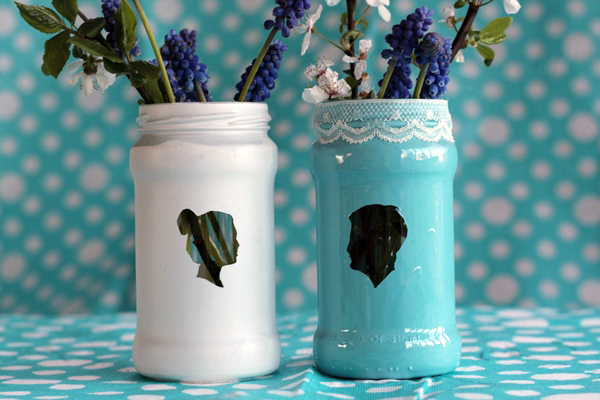 You've taken some old jam jars and transformed them in to stunning silhouette vases. In this tutorial you've learned a combination of skills including silhouette making, color blocking techniques and how to upcycle old jam jars. 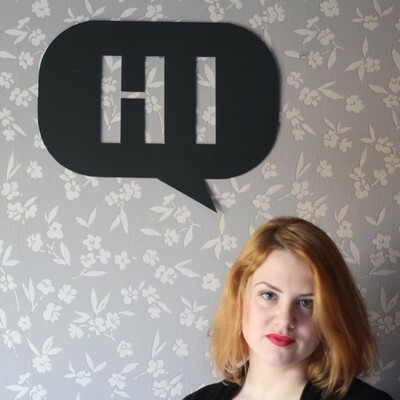 More specifically, you've learned how to create your own silhouettes from photos, how to make stickers from them and how to use the stickers as a color block stencil. The use of personalised silhouettes for decorative purposes makes them ideal gifts, and they can be used as vases or tea light holders at a wedding. Did you enjoy this project? 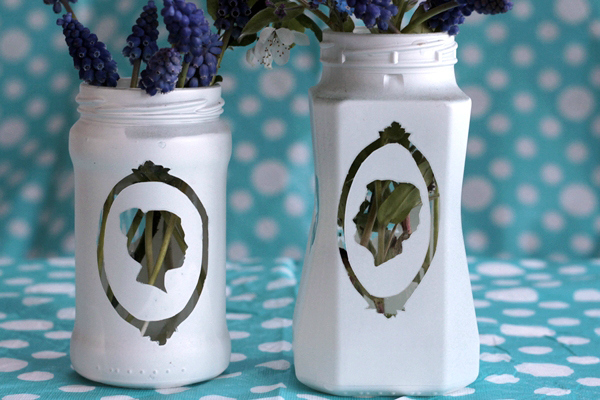 Are you inspired to make your own silhouette vases? Tell us how you go in the comments section below. We'd love to hear from you.